It's a simple fact that in order to profitably promote affiliate / CPA offers that you have to be able to generate cost-effective / targeted traffic. This is why so many fail to succeed. It's also a fact that email produces some of the (if not) the highest ROI of all online marketing methods. It's hard to beat being able to endlessly follow-up and promote new offers at very little cost. With your own lists, you own and control the traffic and can drive traffic to offers at will. You're not at the mercy of any marketing platform that could one day make a change that adversely affects your ability to make a living / income. Of course, it's easier said than done if you don't know what works and what doesn't. However, building large email lists that convert doesn't have to be hard if you follow the info provided in the free blueprint. I will walk you through the exact strategies I've been using for the past 18 years to consistently build email lists in the 100K's + / generate millions in CPA commissions. Which will truly give you the potential to become a super affiliate email marketer. You'll learn how to completely transform your affiliate / CPA marketing business or the steps needed to build a highly successful new one from scratch. 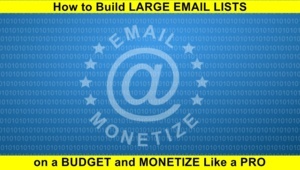 You'll learn the "little-known" list building methods I use (fresh / targeted...3rd party data, rev-share, and real-time co-reg) that have allowed me to build large lists for a fraction of the cost of mainstream methods. I will show you which are the best evergreen verticals (niches) for building lists that you can promote offers to year round. Along with the type of offers that consistently generate the highest conversions. Plus how to do this without ever having to make a sale ... using 100% free offers. I don't hold back any secrets and the blueprint contains zero theory, hype or BS. As a bonus, you'll receive free access to the private Facebook group where you can learn even more and stay on top of changes in the business. You can take what you learn and implement the strategies on your own or if you want me to hold your hand and help you set everything up, it can be arranged. No matter what your skill level ... I guarantee that the blueprint will open your eyes to alternative email marketing strategies, even if you don't promote affiliate / CPA offers. The information provided in the blueprint is based entirely on my experience and contains zero theory, hype or BS. The email lists and revenue figures stated above are my personal figures. Please understand my results are not typical, I'm not implying you'll duplicate them. The average person who acquires any "how to" information gets little to no results because they don't follow through and implement what they learn. I'm using these references for example purposes only. Your results will vary and depend on many factors ... including but not limited to your background, experience, and work ethic. All business entails risk as well as massive and consistent effort and action. If you're not willing to accept that, this probably isn't for you. If I have a generic list of people that I have generated through Facebook adverting, how much work is required to segment them and monetize the various segments? You segment data based on any data points that already exist or actions taken by the users. Then use the segment(s) in a way that you believe will have a higher chance of producing a conversion. This isn't something I can answer regarding your list, as I know nothing about it. This sounds great. But where do we get the Pay Per Lead programs themselves? Sign up to CPA networks. Most have PPL offers. Can your strategy be used to attract leads for business to consumer (B2C) products, services like Real Estate, Insurance, etc.? Or is there a paid version, where I could customize my email efforts for these types of leads? IMO, lead gen is where the money is at. All a user has to do is fill out a form for the offer to convert compared to an offer you have to make a sale. Getting a user to take out their credit card and make a purchase is significantly harder and lower converting. Do you have any student success stories or testimonials should one decide to buy your paid course? If anyone has questions regarding paid training they should contact me directly. I am a newbie in cpa marketing can i still learn and make money from this blueprint? I think it comes down to the person and how much effort they want to put into it learning it. The email monetization business isn't mainstream, so it's going to be new to most marketers regardless of their experience level. Obviously, those that already have some experience will find it easier over those that have none. However, that's the case for pretty much everything. Thanks Diablo for taking the time to offer us the opportunity to get into email marketing. Do you see the upcoming california privacy law damaging or changing the business in the future? Or a similar law if passed on a federal level? I am sure I am not the only one to have such concern especially after seeing the GDPR. Would love to hear your comment on this. I have my doubts anything will ever happen on a federal level. I haven't read the CA law / it doesn't go into effect till next year. Not really concerned about it at this time. Worst case scenario, you scrap / don't buy CA 3rd party data. Well big tech companies are pushing for a federal law. Many in the tech industry feel that a patchwork of state laws similar to the CCPA would be far more troublesome and expensive to comply with than one unified set of federal privacy regulations so tech companies feel their best play is to get out in front with their own industry-supported legislation that contains terms that are as friendly to them as possible. As I said, I haven't read the CCPA and not really worried about it since it's just CA. If something was to ever happen on a federal level, it will come down to what is in it. Until then, I'm not sweating it. If tech companies lobby Congress for what they want it will probably just help soften the outcome and be more business-friendly. I heard the emailing business is getter harder with time, is this true? For years there have been those that say it's getting harder / coming to an end. Still, nothing in my opinion, beats it. Sure it's harder than in the early days, but what isn't? In a nutshell what I understand you basically offering to show us how to buy B2C email lists and send cold emails to generate leads for CPA offers? Can I use this for a home based business opportunity that I am into? The bulk of what I have always promoted and done extremely well with are PPL (pay per lead) offers. Bizop/mmo has never performed that well for me. However, I never tried that hard with them, because I always had other offers that worked and it's all about the path of least resistance to getting conversions for me. How much is the initial investment and what will we use it for? Fb ads? I covered start-up costs in an earlier post below. also tried to find email address listed on the thank you page you mentioned in the very beginning comment, but can't find that page. could you please tell how to fix it? Sounds like some kind of getresponse problem. However, when I test, I don't get one. received your PM, but could not reply PM directly as system prompt 'must reach 5 posts before being able to send PM'. I just registered 2 days before, haven't posted that number yet. as described in my initial comment, I can't get the copy of your blueprint, could you please send me a copy or download link directly? I just tried your link on offer page again, still the same problem. What is a realistic earning potential for your program? Most mailers that are in the business and have built up decent data and know what they are doing, generate $10K - $100K per month. However, there are those that make far less and far more. Much comes down to one's efforts/ability to build and manage the infrastructure that is required to scale to the level that they want to achieve. So are your students getting these kinds of results with your program? Does your program equip us with the knowledge/ability to get these kinds of earnings? Yes, with the training you will certainly walk away with the knowledge and ability. With any training, there will always be mixed results. I know that some that I have taught have made 6 figures and there have been those that struggled and some that never did anything...never sent a single email. Is 7 figures a year a realistic goal if I want to get into this? I am not trolling I am seriously asking. Any students got to this amount so far? I'm not aware of any students reaching this level. However, most don't stay in touch once they are fully up and running and it's not something that is going to happen quickly. With that said, It is possible. It's all a matter of scale. If you belong to any quality CPA networks, ask your AM what their top mailers are doing and I there will be those that are at that level. Created this account just to post here. I fell to "warrior special offers" scams before..
how is this different than others offers? How can we trust what you are offering is real? You claim you have been doing this for over 18 years using methods not known to the mainstream which is a bold claim that part caught my interest to be honest at the same time not sure if we can trust you. The blueprint I'm offering is free. I've been monetizing email data for over 18 years and it's far from mainstream. The WF account I currently have is 7+ years old and I have been posting about it the entire time. Feel free to contact me at the address listed in the blueprint if you have any questions. Forgive my skepticism but why reveal your edge to us at all? If you really are in the 6-7 figure income why you are revealing this and offering extensive training on how to do it too? You are doing like all these "gurus" or should I say marketers are doing which is actually selling us the dream and not doing. When I first started I had that way of thinking and most in the business do. Didn't tell anyone anything in fear of creating competition. Next month I will have been doing this for 18 years and never think about such anymore. There is so much data that exists that it would be impossible for me to monopolize. So I don't care who learns / knows about the methods. If it helps someone out ... cool. Do you ask people to refer to others about your course so that they earn a commission? Lots of products here are like that. No, I don't ask people to refer. Email marketing is very mainstream how are you claiming what your doing is far from it? There are numerous sources online on how to do email marketing. If you actually read the blueprint you would understand. Starting out which method you recommend to start with? Co-reg, Rev-Share, aged data, or buying mail lists? Especially for people with limited budget. Co-reg or rev-share. They both have their own pluses and minuses. Which I'm not going to go into here. You can contact me directly through the link in the blueprint. how much is the cost if you setup everything for us?? I don't offer such. You really need to learn how to do it yourself, that way you don't have to rely on others. I do offer paid extensive training where you will learn everything step-by-step. If interested, contact me through the link in the blueprint. how much are u investing right now and how many subs are you getting? I acquire fresh / targeted 3rd party data on a daily basis. These are not subs, but users who have given permission to receive messages from third parties. From which I develop open / clicker lists. I also generate real-time co-reg leads which are essentially opt-ins and cost $.25 - $.45 each. Read the blueprint for details. What kind of budget is recommended to get started? Basic startup costs (resources you need to acquire) will run approx $100-$200 depending on which method you start with. After that, it's just a matter of scaling. Which there is no real min/max required. Just a matter of what your budget affords you. If someone wants me to hold their hand step by step, I do offer paid training which is much more in-depth and comes with $1,000's of free bonuses. It doesn't work....Keep getting "getresponse" msg. I had someone else tell me this. When I test, it works fine. I contacted getresponse and it should be fixed. If anyone has a problem, there is an email address listed on the thank you page that you can message and get a direct link. Be sure to send using the same email you subscribed with.